The Ukulele Tuner does exactly what it says on the tin. By providing either plucked notes or continuous tones to tune to, it is now much easier to tune your Ukulele in readiness for practice or performance. The Uke Tuner takes a visual approach to tuning making it easy for younger players or students to see which string they are tuning up, and easy for teachers to get a whole group tuning at once. As well as working brilliantly, the Uke Tuner also looks great, making a real statement and providing a focal point for teacher demonstrations. I originally came up with the idea when a family member bought a Ukulele. To tune the instrument they were using a website that played the notes, but it wasn't as helpful as it might have been. So I thought I would make a special application that made tuning easier. It was not originally intended to be a teaching aid, but I decided it wasn't doing much good just sitting on my hard drive. 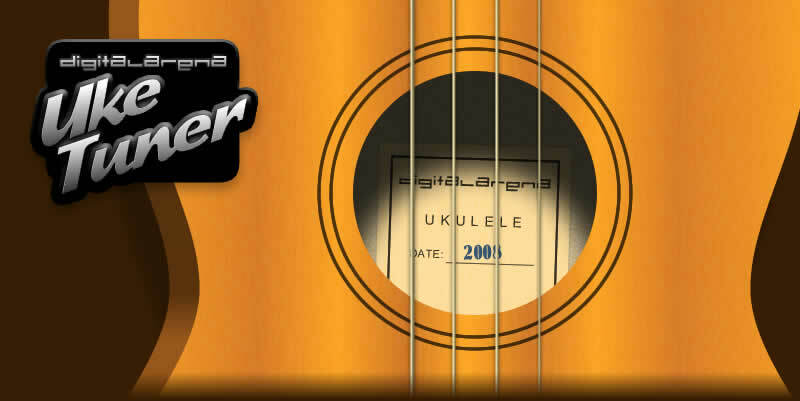 Feel free to download and use Uke Tuner to your hearts content, and even pass it on to your friends. Ukuleles are a low cost introduction to stringed and strummed instruments. Make sure your Ukulele band is playing in tune with the Uke Tuner. The visual approach to tuning can be used in class to reinforce string names and make it easier to explain and teach the tuning process. Uke Tuner works just as well on a projector as it does on a monitor, making it easy to demonstrate to the whole class.